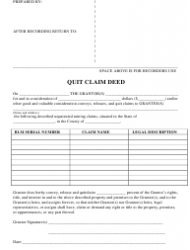 A quitclaim deed is a written legal instrument used to transfer the interest in real estate from the seller (grantor) to the buyer (grantee). 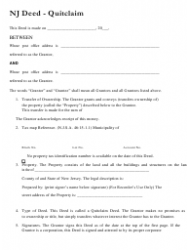 It is one of the four main types of real estate deeds, and it provides the least amount of protection for the grantee. When the deed is properly done and executed, the interest the grantor has in the real estate is transferred to the grantee. 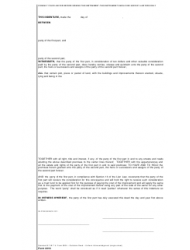 After that, the grantor terminates any claim and right to the real estate. 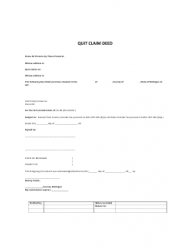 Usually, quitclaim deed templates are used when you need to clarify whether real estate is separate or joint in a marriage or when you want to gift real estate to another individual. 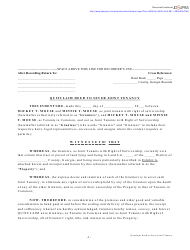 Unlike other real estate deeds that come with some type of warranty, a quitclaim deed does not offer any warranty to the status of the real property title. 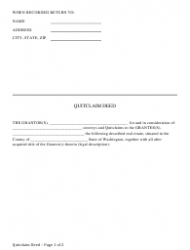 The grantee is only entitled to the interest the grantor actually has at the time the deed is made. Basically, that allows the grantor not to make any promises regarding the actual ownership or the interest in the real estate, denying the grantee sufficient means of legal protection. 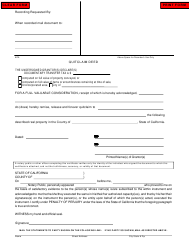 Generally, these forms include an identification of the grantor and the grantee, the name of the state where the real estate is located, its address and legal description, the date of the interest transfer, the contact information of the entity or the individual who will receive tax bills and necessary information, the signatures of both parties, and the signature and the official seal of a notary public from the state/county where the real estate is located.